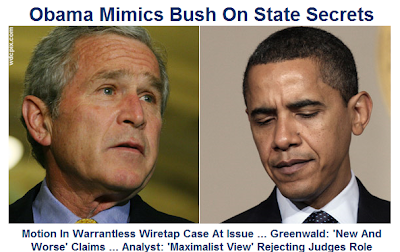 TPM: "Obama Mimics Bush on State Secrets"
The controversy over Obama's embrace of radical Bush/Cheney secrecy powers is clearly growing. Why is Obama following Bush's lead on state secrets? Is the Obama administration mimicking its predecessor on issues of secrecy and the war on terror? . . .
Coming on the heels of the two other recent cases in which the new administration has asserted the state secrets privilege, the motion sparked outrage among civil libertarians and many progressive commentators. Salon's Glenn Greenwald wrote that the move "demonstrates that the Obama DOJ plans to invoke the exact radical doctrines of executive secrecy which Bush used." MSNBC's Keith Olbermann called it "deja vu all over again". An online petition -- "Tell Obama: Stop blocking court review of illegal wiretapping" -- soon appeared. That's rather definitive (my legal analysis of the Obama position was set forth here, on Monday). The TPM article then quotes numerous experts lambasting the Obama administration, including -- most amazingly -- Ken Gude, a national security law expert of the Center for American Progress (CAP). That's John Podesta's CAP, one of the most pro-Obama organizations in the country (Podesta was Obama's transition chief). Speaking to Marc Ambinder, Gude himself actually defended (or at least excused) Obama's first invocation of the state secrets privilege in the Jeppesen/rendition case back in February at a time when most civil libertarians were furious, insisting back then that the new Obama DOJ officials "deserve the benefit of the doubt" because they had been in office too short of a time to warrant any judgments being made. But so extreme and inexcusable are Obama's actions here that, now, even Gude pronounced Obama's position "disappointing" and described himself as "frustrated" and "uncomfortable" with the DOJ's actions. Moreover, to TPM, Gude "confirmed that the Obama-ites were taking the same position as the Bushies on state secrets questions" and added: ""There's going to be people who are very unhappy, and justifiably so." This controversy is clearly growing, as well it should. These radical theories were not ancillary to the liberal critique of Bush/Cheney lawlessness but central to it. Last night on CBS News, Katie Couric repeatedly asked Eric Holder about this issue, and -- as The Washington Independent's Daphne Evitar noted -- Holder was forced to say that he has reviewed the cases where the Obama administration invoked "state secrets" and agreed with virtually everything the Bush administration did in those cases with regard to that doctrine, making clear (as Evitar put it) "that the Obama administration [with the possible exception of one unnamed case] is unlikely to depart dramatically from the Bush administration’s position on the use of the state secrets privilege." The Bush administration's use of the "state secrets" privilege was the linchpin of its efforts to shield its criminality from judicial review and -- as Democrats, progressives and other Bush critics repeatedly argued -- was one of the principal prongs of its lawlessness and radicalism. Yet here is the Obama administration doing exactly the same thing and now admitting that they intend to continue to do so. Relatedly, Jim White digs up some election year Obama quotes to underscore what a betrayal of Obama's constant commitments these actions are. Finally, Keith Olbermann continued his excellent and rather tenacious coverage of this issue last night by asking Nancy Pelosi about the Obama position on state secrets and sovereign immunity and he extracted a muddled though still unambiguous decree that she found it objectionable and would engage in efforts to limit Obama's asserted powers (we'll see how true that ends up being). Last night, Olbermann also had on EFF's Kevin Bankston, who -- along with Olbermann -- excoriated Obama for not merely embracing, but surpassing, some of the worst Bush/Cheney abuses on secrecy and legal immunity for lawbreaking. On Monday afternoon, I asked the office of Russ Feingold -- who was endlessly vocal on these matters when Bush was President -- why he has been silent on this matter and whether he had any comment, and I've heard nothing back. In fairness, though, there is one impressive ally for the Obama DOJ: the highly prestigious and very well-regarded blog, RedState, which vigorously supports their position here. Ultimately, the responsibility to check executive power and secrecy abuses by the President lies with the Congress. In February, numerous members of both the Senate and House -- including Feingold and Arlen Specter -- re-introduced legislation that would substantially limit the President's ability to assert "state secrets" as a means of blocking judicial review of his conduct. When Bush was President, that legislation attracted numerous Democratic co-sponsors -- including Obama's Vice President Joe Biden and his Secretary of State, Hillary Clinton. Clearly, and quite regrettably, that law is needed as much now as it was in 2006 and 2007. Accountability Now, hopefully in conjunction with others, should have a campaign very soon to help bring this about as well as impose limits on Obama's recklessly broad assertions of legal immunity. One brief correction: in yesterday's post on my Cato report on drug policy, I provided the wrong link to a piece reporting on that event by Stop the Drug War's Scott Morgan. The correct link is here. UPDATE: In addition to Roth's TPM article, also very worth reading is this analysis from The Washington Post's Dan Froomkin, who says there "there is something utterly un-American" about Obama's position. As Roth concludes: "That looks like a pretty broad consensus in opposition to the Obama administration's position. And it's the opposite of change we can believe in." Q. Last Friday, the Justice Department invoked the state secrets privilege in asking a judge to dismiss a civil suit filed against the National Security Administration regarding its domestic surveillance program. And in its brief, the Justice Department argued that Americans have no right to sue the government for alleged illegal surveillance. Q. Before he was elected, the President said that the Bush administration had abused the state secrets privilege. Has he changed his mind? Q. So he still thinks that the Bush administration abused the state secrets privilege? Given that Obama is doing exactly what Bush did in this area, Gibbs' claim that Obama "still thinks that the Bush administration abused the state secrets privilege" must be one of the most incoherent and intellectually dishonest claims to come from the White House since the Inauguration -- either that, or Obama believes that Bush abused the privilege and that he, Obama, is also doing so. UPDATE III: Last night (Thursday), Sen. Feingold's office emailed me a statement from the Senator in which he said: "I am troubled that once again the Obama administration has decided to invoke the state secrets privilege in a case challenging the previous administration’s alleged misconduct." He added that "it is clear that there is an urgent need for legislation to give better guidance to the courts on how to handle assertions of the state secrets privilege," and that he is now working "to pass the State Secrets Protection Act [which I wrote about here] as soon as possible." Feingold's full statement is here. UPDATE IV: ABC News' Jake Tapper has a good write-up on this controversy and Obama's history of violating his own commitments when it comes to surveillance, accountability and secrecy powers, with this headline: "On 'State Secrets,' Meet Barack W. Obama." UPDATE V: Jake Tapper has more, here, on the still-growing controversy. I have requests in to numerous key Democratic members of Congress who vehemently opposed the Bush version of the state secrets privilege -- including Senate Judiciary Committee Chairman Pat Leahy and House Judiciary Committee Chairman John Conyers, as well as Sen. Sheldon Whitehouse -- for comment on what the Obama DOJ is doing. I will post those as I receive them. There is simply no legitimate excuse for members of Congress who objected to Bush's secrecy and executive power abuses to remain silent (or, worse, to offer excuses) when Obama does exactly the same thing. I am troubled that once again the Obama administration has decided to invoke the state secrets privilege in a case challenging the previous administration’s alleged misconduct. The Obama administration’s action, on top of Congress’s mistaken decision last year to give immunity to the telecommunications companies that allegedly participated in the warrantless wiretapping program, will make it even harder for courts to rule on the legality of that program. In February, I asked for a classified briefing so that I can understand the reasons for the Department’s decision to invoke the privilege in another case, and I intend to seek information on this new case as well. I also encourage the greatest possible public accounting of the use of the state secrets privilege and welcome the Attorney General’s statement that he hopes to share his review with the American people. Beyond the particular case at issue here, it is clear that there is an urgent need for legislation to give better guidance to the courts on how to handle assertions of the state secrets privilege. The American people must be able to have confidence that the privilege is not being used to shield government misconduct. That is why I am working with Senators Leahy, Specter, and others to pass the State Secrets Protection Act as soon as possible.